IS OUR BILL OF RIGHTS DEAD? Those who do not know true history are doomed to repeat it. “Experts” are telling the American people that the Bill of Rights is DEAD and gone, that the only rights we have are those rights which the Supreme Court and our federal government allow. Are they right? Following three months of fiery debate at the Philadelphia Constitutional Convention, a U.S. Constitution signed by 38 of the 41 delegates emerged on September 17, 1787, which we refer to today as Constitution Day. The Constitution would not take effect until at least nine of the original thirteen colonies ratified. Five states ratified it in quick succession, Delaware, Pennsylvania, New Jersey, Georgia, and Connecticut. But other states refused to ratify, opposed to the document as it failed to reserve undelegated powers to the states and lacked constitutional protection of basic rights. In February 1788, a compromise was reached under which the other states would agree to ratify the document with the assurance that amendments would be immediately proposed. Fearing that constitutional text like the supremacy clause, the commerce clause, the general welfare clause, the necessary and proper clause and others were simply too broad, more than a hundred amendments were immediately proposed by Founders in the First Congress. By September of 1789, the First Congress had approved twelve of those amendments. On December 15, 1791, Virginia became the 10th of 14 states to approve 10 of the 12 amendments, thus giving us the Bill of Rights, ratified by the two-thirds majority of states necessary to make it binding. The Bill of Rights was largely drawn from Virginia’s Declaration of Rights, drafted by George Mason in 1776. Mason, a native Virginian, was a lifelong champion of individual liberties, and in 1787 he attended the Constitutional Convention and criticized the final document for lacking constitutional protection of basic rights. It was Mason who led the First Congress to create and ratify what we now call The Bill of Rights, the first ten amendments to the constitution. The U.S. Constitution would have never been ratified without assurances and protections in the Bill of Rights. The first ten amendments removed any doubt about the intentions of the Founding Fathers in their design for a limited federal government of, by and for the people and their states respectively, deriving all of its just powers from the people. The Bill of Rights is by no means a complete list of individual or states’ rights. It is a list of additional limitations and restrictions upon the federal government created by the compact, the U.S. Constitution, amending the text of the U.S. Constitution in such a manner as to remove any ambiguity concerning certain inalienable rights of the people and their states. The preamble to the Bill of Rights establishes the clear intent of the Founders to further clarify and restrict federal powers, and ensure a Constitutional Republican form of government in which power would not only be balanced between three federal branches with unique and equal powers, but also balanced between federal, state, local and individual rights. These are not just our Bill of Rights, they are a short list of inalienable rights and they are amendments to the U.S. Constitution, without which, the constitution itself would never have been ratified by the states, a union of the states could not have been created and our federal government would not exist. This is to affirm that without our Bill of Rights, intact and enforced, there is no compact between the states at all. The product of our Founders exists in total, upon the terms and conditions of the U.S. Constitution and Bill of Rights, or none of it exists. According to an increasing number of “expert” sources today, our Bill of Rights is DEAD. The people’s silence on the matter is being interpreted as their consent. In a remarkable video clip from a recent state debate over states’ rights in the Tennessee legislature, lawyer and Senator Brian Kelsey made an astonishing claim… that the Tenth Amendment doesn’t mean what it says, that states are subservient to the federal government under the supremacy clause, which trumps the Bill of Rights, even when the federal government is overtly acting beyond its constitutional authority and in direct violation of the Bill of Rights. According to attorney Brian Kelsey, the federal supremacy clause prohibits the states and the people from enforcing the Bill of Rights, even when it is clear that the federal government is acting in a despotic and tyrannical fashion, in direct violation of the people’s Bill of Rights. That is an absolutely chilling statement, especially coming from a Tennessee Republican Senator who also holds a law degree and license to practice. Mr. Kelsey is stating that the Bill of Rights is unenforceable due to the federal supremacy clause, thereby legally DEAD, null and void. Where did Mr. Kelsey get such a treasonous false notion? The answer appears to be, law school… as Mr. Kelsey is by no means alone in his views. American law schools stopped teaching constitutional law and started teaching only the procedure for creating law by setting precedents in the mid-1940s. However, the Constitution grants the judicial branch no law-making authority whatsoever. Today’s lawyers have a totally perverted understanding of the Constitution, as a result. In a recent letter from Michigan State Speaker of the House Jase Bolger dated February 22, 2013, in which he relies upon the “expert” advice of his legislative attorney Doug Mains, Bolger makes the same treasonous false claims. Tennessee Attorney General Robert Cooper, Democrat son of Democrat U.S. Representative Jim Cooper, also goes to great lengths in his brief to assert the same false claims, establishing in his “expert” opinion that the Bill of Rights is DEAD. Similar statements have been made by Texas Attorney General Greg Abbott and numerous other federal and state officials. When state legislators attempted to protect states and individual rights with the introduction of a Constitutional Balance of Powers Act drafted entirely upon the U.S. Constitution and Bill of Rights, Left Wing groups like Democratic Underground and Daily KOS came out in force to attack those legislators. They just couldn’t grasp any state attempting to uphold the Constitution and Bill of Rights by rejecting the “unconstitutional acts” of a runaway federal government. All of a sudden, leftwing propaganda machines and State Republican legislators appeared to be on the same side, opposing states and individual rights and supporting unbridled federal supremacy. Even a number of leftwing Democrat law professors are publicly attacking the “crazy notion” that the Bill of Rights still exists in force and effect. The leftist argument that the Bill of Rights no longer exists today is based entirely upon two totally perverted interpretations of Constitutional Law. It is not an accidental misinterpretation either, it is with specific purpose. The first perversion of constitutional law is in the misinterpretation of the federal supremacy clause. The second is in the belief that the U.S. Supreme Court has the constitutional authority to grant itself the unbridled power as an unelected oligarchy, as the court attempted to do in Marbury vs. Madison. What does the federal supremacy clause actually say? That’s what the federal supremacy clause says, but what does it mean? First, it affirms that the U.S. Constitution is indeed the “supreme law of the land…” – and then it affirms that “the laws of the United States which shall be made in Pursuance thereof” also have supremacy. The Founders often capitalized a word to emphasize its importance… as is the case here with Pursuance and the power of congress to enforce The Law of Nations in the enumerated powers of congress. What they meant by “the laws of the United States which shall be made in Pursuance thereof” is that the laws of the United States which were created in Pursuance, or furtherance, or affirmation, or conformity with the U.S. Constitution, which includes the Bill of Rights, would have supremacy. Article VI, Section 2, of the U.S. Constitution is known as the Supremacy Clause because it provides that the “Constitution, and the Laws of the United States … shall be the supreme Law of the Land.” It means that the federal government, in exercising any of the powers enumerated in the Constitution, must prevail over any conflicting or inconsistent state exercise of power. The concept of federal supremacy was developed by Chief Justice John Marshall, who led the Supreme Court from 1801 to 1835. In mcculloch v. maryland, 17 U.S. (4 Wheat.) 316, 4 L. Ed. After the Civil War, the Supreme Court was more supportive of States’ Rights and used the Tenth Amendment, which provides that the powers not delegated to the federal government are reserved to the states or to the people, to justify its position. It was not until the 1930s that the Court shifted its position and invoked the Supremacy Clause to give the federal government broad national power. The federal government cannot involuntarily be subjected to the laws of any state. The Supremacy Clause also requires state legislatures to take into account policies adopted by the federal government. Two issues arise when State Action is in apparent conflict with federal law. The first is whether the congressional action falls within the powers granted to Congress. If Congress exceeded its authority, the congressional act is invalid and, despite the Supremacy Clause, has no priority over state action. The second issue is whether Congress intended its policy to supersede state policy. Congress often acts without intent to preempt state policy making or with an intent to preempt state policy on a limited set of issues. Congress may intend state and federal policies to coexist. So, with all of this indisputable history on the side of the states and the American people, why is it that so many of today’s politicians and lawyers read the Constitution and Bill of Rights totally backwards in what appears to be an overt effort to undermine and destroy our Constitutional Republic? Other misuses of history account for much of the constitutional confusion as well, such as the claims that Democrat President Andrew Jackson wanted to hang or shoot “nullifiers” – when in fact, who cares whether or not Jackson hated states’ rights or those who would attempt to enforce them? Tough… as long as the Bill of Rights exists, the states and the people have rights, whether the federal government likes it or not. Other self-proclaimed “experts” created by either the Democratic Party or Republican Party such as Heritage Foundation, also spew the same anti-constitutional hogwash about unchecked federal authority under a false interpretation of the federal supremacy clause. Self-made and self-appointed “experts” like David Barton of Wall Builders also regurgitate the same set of blatant lies based on false history, bad law and evil anti-American intentions. These policy centers gain their power through advising the rich and powerful inside the DC beltway parasites busy robbing Americans of their resources, freedoms and liberties, all of it for their personal financial gain and power. Through ALEC, a national organization of State Republican lawmakers, these parasites have woven their web throughout state legislatures as well and that’s why we now see state officials like Sen. Brian Kelsey, Attorney General Cooper of Tennessee and House Speaker Bolger of Michigan regurgitating these same lies. First, the states cannot nullify “constitutional” acts by the federal government, which is what South Carolina tried to do in its effort to block federal tariffs that were within the constitutional authority of the federal government. Second, any federal act which is “unconstitutional” is void; it exists without any force of law whatsoever. You cannot nullify a law that exists without any legal authority to begin with. As a result, individual issue nullification is not an effective means of dealing with federal tyranny at the state level. Efforts to shut down individual nullification bills will continue to be successful, and rightfully so. The specific act of state nullification of federal laws, as defined by today’s proponents, is indeed “unconstitutional.” The constitution allows no single state the authority to “nullify” federal laws for the entire nation, under a false belief that such nullification can only be overturned by three-fourths of the states. Because “unconstitutional” acts of the federal government are VOID on their face, without any force of law whatsoever, the states and the people are under no moral or legal obligation to recognize, abide by or enforce such federal acts. The proper method of dealing with the “unconstitutional acts” of the federal government at the state level is a constitutional review panel made up of Representatives of the people within the state, which then recommends that the state either affirm or reject the federal act within the boundaries of the state. The North American Law Center researched and drafted The Constitutional State Balance of Powers Act for state legislatures on this base, drawn directly from the U.S. Constitution and Bill of Rights. In order for the Balance of Powers Act to be “unconstitutional,” the Constitution and Bill of Rights would also have to be “unconstitutional,” which seems to be the belief of many politicians and lawyers today. If any state fails to pass the Balance of Powers Act, the people of that state have NO constitutionally protected rights, NO protections under the Bill of Rights and NO Constitutional Republican form of government. At that moment, the “experts” will be correct, the Bill of Rights will be DEAD in that state. 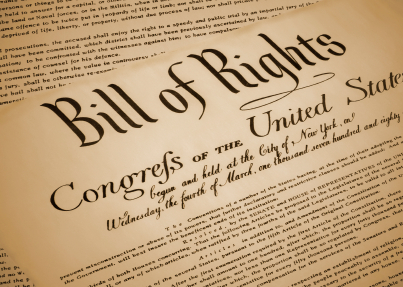 Is Our Bill of Rights Really DEAD? Many of today’s politicians and lawyers have been trained to subvert the U.S. Constitution and Bill of Rights, rather than uphold, protect and defend against all enemies. International political powers intent upon destroying America’s sovereignty and security for the purpose of plundering American resources for the greater good of the global community have infiltrated both major political parties. Through their policy think tanks, they create false history and bad law aimed at undermining America’s Charters of Freedom. Are they right? Is the Bill of Rights DEAD just because politicians (public servants) say so? Is it DEAD just because the Supreme Court has attempted to grant itself powers which the Constitution does not grant to the courts? Is it DEAD just because partisan think tanks tell you it is? If the Bill of Rights is DEAD, how is the Constitution still alive? Without the U.S. Constitution, the compact between the sovereign states which creates the United States and its republican federal government, and the Bill of Rights, the first ten amendments to the U.S. Constitution, there can be no republic, no union of the states and no federal government, which means no federal authority at all. The only means of protecting and preserving the Constitutional Republic is to uphold and enforce the Constitution of the United States and the Bill of Rights. This is exactly what every American must do in order to keep their republic and the people must remove from power, any public servant who has demonstrated any opposition to these precious concepts of freedom and liberty. The people must enforce their rights, or they do not have any rights.